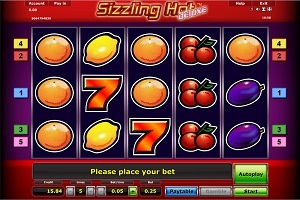 The Sizzling Hot Deluxe is a classic slot machine where you try to line up 5 symbols on a payline in order to win big. You will find familiar fruit symbols as melons, plums, cherries and oranges. The scatter is the star symbol and the highest paying symbol is the 7. There are no free spins or bonus feature on this slot machine, only the basic gamble feature which gives you a 50/50 chance to double your winnings. Graphics & Appearance: Sizzling Hot Deluxe is a yet another very classic slot machine from Novomatic. It has a very simple and “old school” look. There are no special features that will expand or overwhelm the player but that might not be a bad thing. If you’re looking for a fun and simple slot game, Sizzling Hot might just be what you need. Gamble Feature: Sizzling Hot Deluxe has a gamble feature where you pick a colour of the next card that will be shown (red or black). If you pick the right colour, your winnings are doubled and you can collect or perhaps gamble again. If you pick the wrong colour, your winnings are lost and you return to the game. Game Symbols: You will find fruit in this game; melons, grapes, plums, oranges, lemons and cherries. You also have the highest paying symbol, 7, that will pay 5,000 times your stake if you hit 5 of them on one payline. The scatter is a Star symbol which pay on any position. Bonus Feature: There are no Bonus Features in this slot. Betting Options: You can bet on 5 paylines over 5 reels. Your stake amount is controlled by using the + and - symbol. You can stake from a minimum of 0.05 of your gaming currency per payline. The highest payout is 5,000 times your stake by hitting five 7’s on one payline. Game Features: Sizzling Hot Deluxe offer the players to use an Autoplay feature. By using the Autoplay feature you will not have to click on the Start button for every spin you wish to play. This feature can be very comfortable to use in order to be able to sit back and relax in a nice gaming environment. The Autoplay is activated by simply pushing the Autoplay button in the bottom right corner of the game window. You don’t have to set a certain amount of spins that you wish to be played automatically. You just need to activate it. Once this is done, the feature is easily stopped by clicking on the Stop button. Note that you will not access the Gamble Feature while you use the Autoplay.